Flint Begins The Long Process Of Fixing Its Water Problem Experts are scrambling to define the scope of the water contamination disaster in the city of nearly 100,000 and determine how to replace corroded pipes, while making sure to keep the public informed. 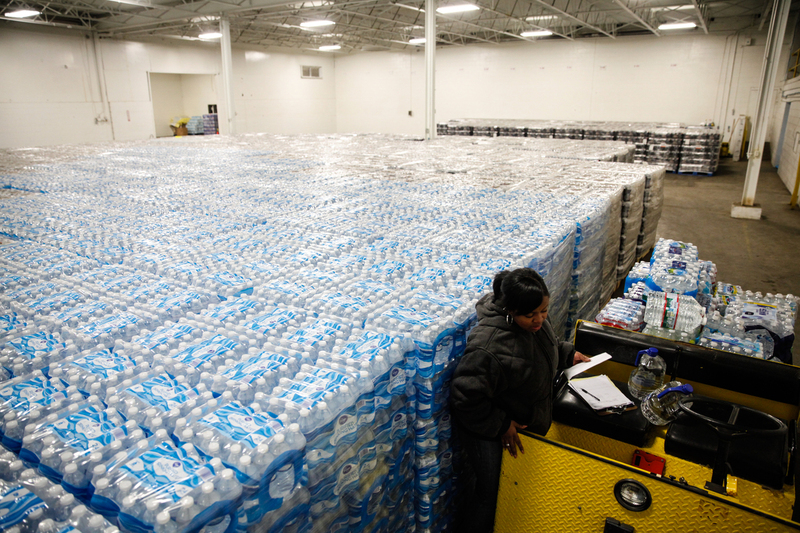 Pallets of bottled water are seen ready for distribution in a Flint, Mich., warehouse on Jan. 21. The warehouse is the emergency water supply for Flint residents affected by lead-contaminated water. On a recent day, Collins is distributing bottled water at Triumph Church in Flint. A massive 18-wheeler is parked in front of the church. It's from Columbus, Ohio. Two more trucks are arriving later in the day. These trucks are all full of donated water bottles. Collins is overseeing a team of church volunteers that hands out literally thousands of bottles each day. And they'll continue doing it, she says, as long as the water comes. To figure out just how long there will be a need for bottled water, experts need to start by measuring the scale of the problem. Flint has nearly 100,000 people. How many of those people have lead pipes leading to their homes? Marty Kaufman, a professor of earth and resource science at the University of Michigan, Flint, set out to answer that question. For a couple of weeks now, Kaufman has been officially contracted to work with the city. But in October, he went to the city and requested the records showing which homes have lead pipes. "We were taken aback when they showed us a big file drawer that had 45,000 cards," he recalls. He's talking about, literally, 45,000 index cards, noting which pipes were lead, which were copper and so on. "One of the big problems is they were written in pencil, so they were smeared quite a bit too," he says. Kaufman realized a bunch of handwritten notes in smeared pencil would never work. So he went back to city officials to see if there was another source for this information. It turned out, there was: parcel maps from the city water department, showing city blocks divided into little squares of property, with a code that indicated which type of service line was running into each house. The city scanned 240 of these maps into a computer, and Kaufman's team methodically pieced them together, inputting the data about what the pipes are made of in each place. 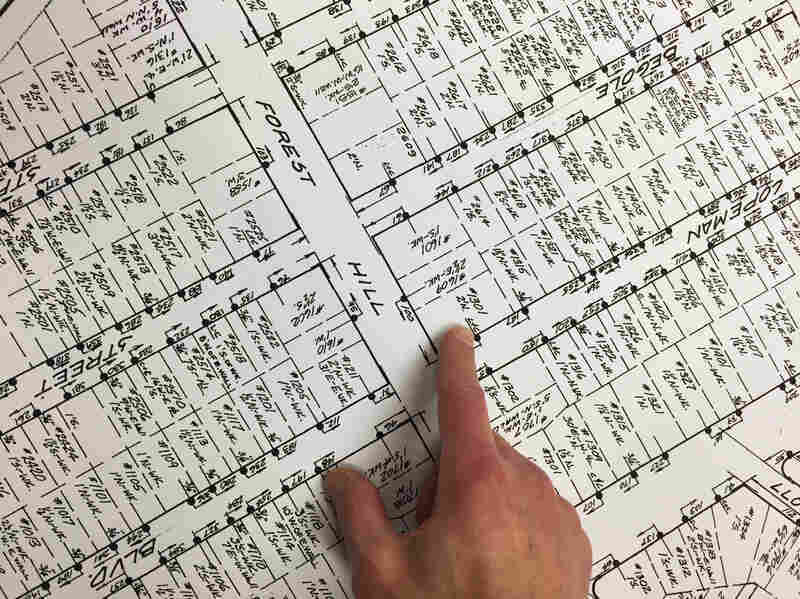 Marty Kaufman of the University of Michigan, Flint points to a map showing a house where the pipe is made of lead and copper. Kaufman and his team have been piecing together city data to figure out which homes have lead pipes. As of last week, they were just completing the project. But this is just one step. The information in these maps is from the 1980s. Nobody knows how accurate they are. And they have big, blank areas. "Ultimately any time you make a map," Kaufman says, "you have to field-check your information." In other words, compare the map with the real world. After defining the scope of the problem comes the next challenge: fixing the corroded pipes. Over time, the inside of the corroded lead pipes will rebuild a protective film, says Laura Sullivan, a professor of mechanical engineering at Kettering University in Flint. That will make the water safer — but it's not a long-term solution. And nobody actually knows how long the film will take to rebuild. "We've never encountered a situation where the pipes in a city are corroded to the extent these are," she says. Sullivan has worked on clean water projects all over the world, from South America to sub-Saharan Africa. Suddenly, her expertise is needed here in her hometown of Flint. The state appointed her to a committee that is trying to fix the water. Sullivan says it's tricky because trying to fix the pipes could knock off the protective film that's starting to rebuild. But the reality is that all of the pipes will need to be replaced — and that can't happen in two weeks, or even in a month. And that, she says, is a process that shouldn't be rushed. Although Sullivan isn't able to give a timeline for when the work will be complete, she says she believes there is momentum for change. "What I can tell you is I firmly believe that the light is shining so brightly on the city of Flint right now, that if there were any entity that had any negative or malicious reason to slow things down, there's no way they could do that," Sullivan says. "And if there's any entity that has the ability to make things right, they're being empowered to do that." Sullivan understands how frustrated people are not to know when they'll have clean water again. That's why she says she is committed to making sure "nobody's in the dark going forward." And she hopes that the recovery process will create jobs for people in Flint who need work. "What we plan on doing is taking care of this as quickly as possible and involving Flint in taking care of Flint," she says. "We're not saying, 'Oh it's your problem, you have to take care of it,' but saying, 'Everything you need to take care of it, we'll provide, but this is your city and you have the control of this city and we're done having emergency managers telling you what to do. We're gonna help you heal your city.' "
After working on these issues all over the developing world, Sullivan pauses to consider what it means to fight for clean water here in her hometown. "In this situation, I was meeting people I'd never met before, from walks of life I would never have crossed, but they were really very much like me, and so this is more like fighting for my family than it is trying to help people that deserve something better," Sullivan says. "This is more like feeling horribly hurt, because the people who I've been standing with are horribly hurt."